Broadcast on Channel 5 (UK) 10 April 1997 Thurs 4:40 a.m.
One of the two officers gossiping about Vera seems to be Lise Rodgers. Thanks to Roger Campion for spotting that the other is Jillian Murray. The role of Father Peterson is credited to Peter Felmingham, but I think he is the same actor later credited as Peter Paulsen (or Pawlsen). Helen is revolted by the breakfast and suggests the women don't eat the food. Bea leads a "down spoons" protest and Vera goes to fetch Erica. Erica decides to let them be for now, predicting that when the women get hungry, Helen will lose her following. Mum gently warns Helen not to cause too much trouble, as protests can soon get out of hand. Lynn arrives home and her mother gabbles away with news to disguise the fact that her father refuses to discuss Lynn's pregnancy. Her mother is planning to tell everyone her husband was killed in an accident, and already has a potential husband in line who won't mind her being a "widow". Helen challenges Erica to eat the food served to the prisoners and Erica agrees, but lets Helen know she's wise to her publicity seeking games. Hearing that Erica will be inspecting the food, Bea and Doreen conspire to make the food truly inedible. 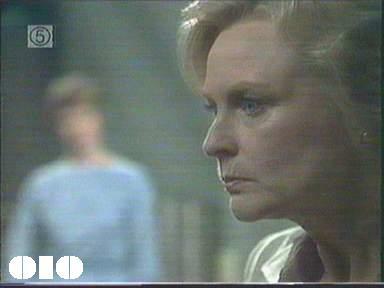 Marilyn is brought back to Wentworth after being arrested for prostitution and runs into Helen again, but Helen brushes off Marilyn's mockery and says she's quite happy in Wentworth. Mum talks to Doug and tries to discourage him from getting in touch with Lynn. Meanwhile Lynn is writing a letter to Doug (oddly, we see that she has signed her name "Lyn" ). Bea arranges for Eddie and Marilyn to talk: they argue instead. Helen's solicitor has prepared a contract giving James total control over the Australasian subsidiary, but says she needs more time to think about it before signing. Erica tastes the food and practically vomits , as the pan of stew has been liberally salted by Doreen. She is forced to agree to Helen's suggestion that the women should be able to work in the kitchen helping to prepare meals. Greg agrees to be a character witness for Helen at her trial. Lynn's old boyfriend Bill rejects her when he meets her in the street. Helen approaches Doreen and asks her about her forgery skills. Vera overhears two of her colleagues gossiping about her drinking and her slim chances of ever getting a man. Helen starts to think she can do anything and promises to get Beth's baby back, much to Karen's annoyance. Meg drops in on Vera at home and is amazed to find her all tarted up. Vera lies and says a friend is taking her out, and after getting drunk at home she goes out to a bar to finish off the job . There she meets Graham Lang , who reveals himself to be an off duty police officer and takes her home before she gets into trouble. Helen gets Doreen to forge her signature on James' contract and gets a powder compact in return. Karen tries to challenge Greg to do something for Beth as she has deteriorated since her baby was taken away, and asks him to contact a prison reform group for her. Helen hands over the signed document to James before she goes to court. Vera takes a call from Graham in Erica's office without permission but of course Erica returns as she is accepting an invitation to go out with him. When Lyn's family is visited by the local priest, her father reveals his true feelings by challenging the moralistic sermon he gives Lynn. After she is cleared of the manslaughter charge, Helen sacks James and tells him the contract isn't valid as it wasn't signed by her. She then appears on television to say what she really thought about the conditions ... and the women, who are glumly watching until Bea switches the set off. Franky cackles with delight that Bea has been shown to be so gullible.